These are our original stretch fit black hats with the lime green dagger on the front and Dryka Armory on the back. 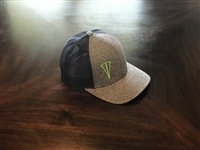 These are our new trucker style flexfit style hats. They have a black front and a grey mesh, with the lime green company logo. This is one of our latest additions to our hat line and we hope you enjoy it as much as we do! Dryka Armory supports our boys in blue! 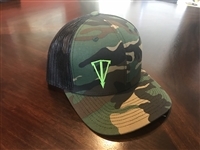 This is one of our latest additions that we just wanted to see what it looked like and we feel like it turned out to be one of our nicest looking hats yet! We love this Snapback are excited to be able to make a hat that reflects our love and support of Momma T! 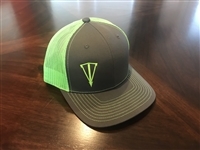 This hat features our company Bible verse on the left side, and a Dryka Green dagger set on a grey front. This hat is close to our dagger 2.0 hat with the exception for he grey front. This hat features our company Bible verse on the left side in Dryka green set on black mesh. On the front we have a Dryka Green dagger set on a camo front. 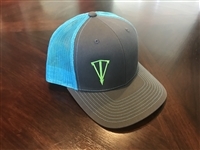 This hat features our company Bible verse on the left side in Dryka green set on a neon blue mesh. We also set the Dryka Green dagger on the left side of the grey front. 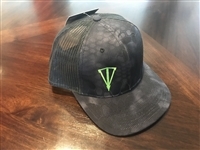 This hat features our company Bible verse on the left side in Dryka green set on a neon black mesh. We also set the Dryka Green dagger on the left side of the Kyptek Camo front. New just in time for Hunting season! These hats are a Velcro back and fit almost everyone!